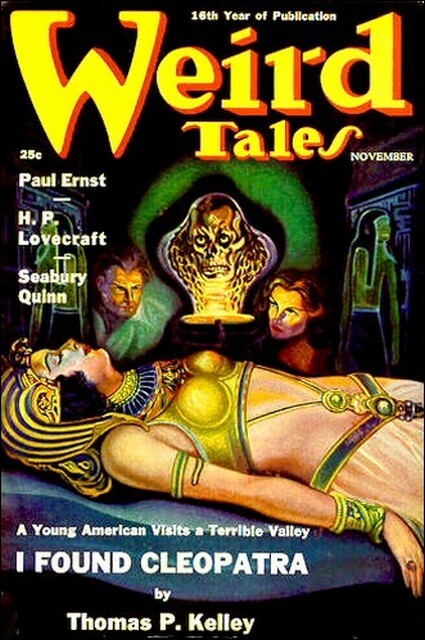 Weird Tales, November 1938, with reprint of "The Nameless City"
I awakened just at dawn from a pageant of horrible dreams, my ears ringing as from some metallic peal. I saw the sun peering redly through the last gusts of a little sandstorm that hovered over the nameless city, and marked the quietness of the rest of the landscape. Once more I ventured within those brooding ruins that swelled beneath the sand like an ogre under a coverlet, and again dug vainly for relics of the forgotten race. At noon I rested, and in the afternoon I spent much time tracing the walls and bygone streets, and the outlines of the nearly vanished buildings. I saw that the city had been mighty indeed, and wondered at the sources of its greatness. To myself I pictured all the splendors of an age so distant that Chaldaea could not recall it, and thought of Sarnath the Doomed, that stood in the land of Mnar when mankind was young, and of Ib, that was carven of grey stone before mankind existed. Very low and sand-choked were all the dark apertures near me, but I cleared one with my spade and crawled through it, carrying a torch to reveal whatever mysteries it might hold. When I was inside I saw that the cavern was indeed a temple, and beheld plain signs of the race that had lived and worshipped before the desert was a desert. Primitive altars, pillars, and niches, all curiously low, were not absent; and though I saw no sculptures or frescoes, there were many singular stones clearly shaped into symbols by artificial means. The lowness of the chiseled chamber was very strange, for I could hardly kneel upright; but the area was so great that my torch showed only part of it at a time. I shuddered oddly in some of the far corners; for certain altars and stones suggested forgotten rites of terrible, revolting and inexplicable nature and made me wonder what manner of men could have made and frequented such a temple. When I had seen all that the place contained, I crawled out again, avid to find what the temples might yield. The moon was gleaming vividly over the primitive ruins, lighting a dense cloud of sand that seemed blown by a strong but decreasing wind from some point along the cliff ahead of me. I knew it was this chilly, sandy wind which had disturbed the camel and was about to lead him to a place of better shelter when I chanced to glance up and saw that there was no wind atop the cliff. This astonished me and made me fearful again, but I immediately recalled the sudden local winds that I had seen and heard before at sunrise and sunset, and judged it was a normal thing. I decided it came from some rock fissure leading to a cave, and watched the troubled sand to trace it to its source; soon perceiving that it came from the black orifice of a temple a long distance south of me, almost out of sight. Against the choking sand-cloud I plodded toward this temple, which as I neared it loomed larger than the rest, and showed a doorway far less clogged with caked sand. I would have entered had not the terrific force of the icy wind almost quenched my torch. It poured madly out of the dark door, sighing uncannily as it ruffled the sand and spread among the weird ruins. Soon it grew fainter and the sand grew more and more still, till finally all was at rest again; but a presence seemed stalking among the spectral stones of the city, and when I glanced at the moon it seemed to quiver as though mirrored in unquiet waters. I was more afraid than I could explain, but not enough to dull my thirst for wonder; so as soon as the wind was quite gone I crossed into the dark chamber from which it had come. Then a brighter flare of the fantastic flame showed that form which I had been seeking, the opening to those remoter abysses whence the sudden wind had blown; and I grew faint when I saw that it was a small and plainly artificial door chiseled in the solid rock. I thrust my torch within, beholding a black tunnel with the roof arching low over a rough flight of very small, numerous and steeply descending steps. I shall always see those steps in my dreams, for I came to learn what they meant. At the time I hardly knew whether to call them steps or mere footholds in a precipitous descent. My mind was whirling with mad thoughts, and the words and warning of Arab prophets seemed to float across the desert from the land that men know to the nameless city that men dare not know. Yet I hesitated only for a moment before advancing through the portal and commencing to climb cautiously down the steep passage, feet first, as though on a ladder. Time had quite ceased to exist when my feet again felt a level floor, and I found myself in a place slightly higher than the rooms in the two smaller temples now so incalculably far above my head. I could not quite stand, but could kneel upright, and in the dark I shuffled and crept hither and thither at random. I soon knew that I was in a narrow passage whose walls were lined with cases of wood having glass fronts. As in that Paleozoic and abysmal place I felt of such things as polished wood and glass I shuddered at the possible implications. The cases were apparently ranged along each side of the passage at regular intervals, and were oblong and horizontal, hideously like coffins in shape and size. When I tried to move two or three for further examination, I found that they were firmly fastened. Just when my fancy merged into real sight I cannot tell; but there came a gradual glow ahead, and all at once I knew that I saw the dim outlines of a corridor and the cases, revealed by some unknown subterranean phosphorescence. For a little while all was exactly as I had imagined it, since the glow was very faint; but as I mechanically kept stumbling ahead into the stronger light I realized that my fancy had been but feeble. This hall was no relic of crudity like the temples in the city above, but a monument of the most magnificent and exotic art. Rich, vivid, and daringly fantastic designs and pictures formed a continuous scheme of mural paintings whose lines and colors were beyond description. The cases were of a strange golden wood, with fronts of exquisite glass, and containing the mummified forms of creatures outreaching in grotesqueness the most chaotic dreams of man. To convey any idea of these monstrosities is impossible. They were of the reptile kind, with body lines suggesting sometimes the crocodile, sometimes the seal, but more often nothing of which either the naturalist or the paleontologists ever heard. In size they approximated a small man, and their fore-legs bore delicate and evident feet curiously like human hands and fingers. But strangest of all were their heads, which presented a contour violating all know biological principles. To nothing can such things be well compared—in one flash I thought of comparisons as varied as the cat, the bullfrog, the mythic Satyr, and the human being. Not Jove himself had had so colossal and protuberant a forehead, yet the horns and the noselessness and the alligator-like jaw placed things outside all established categories. I debated for a time on the reality of the mummies, half suspecting they were artificial idols; but soon decided they were indeed some paleogean species which had lived when the nameless city was alive. To crown their grotesqueness, most of them were gorgeously enrobed in the costliest of fabrics, and lavishly laden with ornaments of gold, jewels, and unknown shining metals. The importance of these crawling creatures must have been vast, for they held first place among the wild designs on the frescoed walls and ceiling. With matchless skill had the artist drawn them in a world of their own, wherein they had cities and gardens fashioned to suit their dimensions; and I could not help but think that their pictured history was allegorical, perhaps showing the progress of the race that worshipped them. These creatures, I said to myself, were to men of the nameless city what the she-wolf was to Rome, or some totem-beast is to a tribe of Indians. Holding this view, I could trace roughly a wonderful epic of the nameless city; the tale of a mighty seacoast metropolis that ruled the world before Africa rose out of the waves, and of its struggles as the sea shrank away, and the desert crept into the fertile valley that held it. I saw its wars and triumphs, its troubles and defeats, and afterwards its terrible fight against the desert when thousands of its people—here represented in allegory by the grotesque reptiles—were driven to chisel their way down though the rocks in some marvelous manner to another world whereof their prophets had told them. It was all vividly weird and realistic, and its connection with the awesome descent I had made was unmistakable. I even recognized the passages. As I crept along the corridor toward the brighter light I saw later stages of the painted epic—the leave-taking of the race that had dwelt in the nameless city and the valley around for ten million years; the race whose souls shrank from quitting scenes their bodies had known so long where they had settled as nomads in the earth's youth, hewing in the virgin rock those primal shrines at which they had never ceased to worship. Now that the light was better I studied the pictures more closely and, remembering that the strange reptiles must represent the unknown men, pondered upon the customs of the nameless city. Many things were peculiar and inexplicable. The civilization, which included a written alphabet, had seemingly risen to a higher order than those immeasurably later civilizations of Egypt and Chaldaea, yet there were curious omissions. I could, for example, find no pictures to represent deaths or funeral customs, save such as were related to wars, violence, and plagues; and I wondered at the reticence shown concerning natural death. It was as though an ideal of immortality had been fostered as a cheering illusion. Still nearer the end of the passage was painted scenes of the utmost picturesqueness and extravagance: contrasted views of the nameless city in its desertion and growing ruin, and of the strange new realm of paradise to which the race had hewed its way through the stone. In these views the city and the desert valley were shown always by moonlight, golden nimbus hovering over the fallen walls, and half-revealing the splendid perfection of former times, shown spectrally and elusively by the artist. The paradisal scenes were almost too extravagant to be believed, portraying a hidden world of eternal day filled with glorious cities and ethereal hills and valleys. At the very last I thought I saw signs of an artistic anticlimax. The paintings were less skillful, and much more bizarre than even the wildest of the earlier scenes. They seemed to record a slow decadence of the ancient stock, coupled with a growing ferocity toward the outside world from which it was driven by the desert. The forms of the people—always represented by the sacred reptiles—appeared to be gradually wasting away, though their spirit as shown hovering above the ruins by moonlight gained in proportion. Emaciated priests, displayed as reptiles in ornate robes, cursed the upper air and all who breathed it; and one terrible final scene showed a primitive-looking man, perhaps a pioneer of ancient Irem, the City of Pillars, torn to pieces by members of the elder race. I remembered how the Arabs fear the nameless city, and was glad that beyond this place the grey walls and ceiling were bare. Reaching down from the passage into the abyss was the head of a steep flight of steps—small numerous steps like those of black passages I had traversed—but after a few feet the glowing vapors concealed everything. Swung back open against the left-hand wall of the passage was a massive door of brass, incredibly thick and decorated with fantastic bas-reliefs, which could if closed shut the whole inner world of light away from the vaults and passages of rock. I looked at the steps, and for the nonce dared not try them. I touched the open brass door, and could not move it. Then I sank prone to the stone floor, my mind aflame with prodigious reflections which not even a death-like exhaustion could banish. As I lay still with closed eyes, free to ponder, many things I had lightly noted in the frescoes came back to me with new and terrible significance—scenes representing the nameless city in its heyday —the vegetations of the valley around it, and the distant lands with which its merchants traded. The allegory of the crawling creatures puzzled me by its universal prominence, and I wondered that it would be so closely followed in a pictured history of such importance. In the frescoes the nameless city had been shown in proportions fitted to the reptiles. I wondered what its real proportions and magnificence had been, and reflected a moment on certain oddities I had noticed in the ruins. I thought curiously of the lowness of the primal temples and of the underground corridor, which were doubtless hewn thus out of deference to the reptile deities there honored; though it perforce reduced the worshipers to crawling. Perhaps the very rites here involved crawling in imitation of the creatures. No religious theory, however, could easily explain why the level passages in that awesome descent should be as low as the temples—or lower, since one could not even kneel in it. As I thought of the crawling creatures, whose hideous mummified forms were so close to me, I felt a new throb of fear. Mental associations are curious, and I shrank from the idea that except for the poor primitive man torn to pieces in the last painting, mine was the only human form amidst the many relics and symbols of the primordial life. My fears, indeed, concerned the past rather than the future. Not even the physical horror of my position in that cramped corridor of dead reptiles and antediluvian frescoes, miles below the world I knew and faced by another world of eery light and mist, could match the lethal dread I felt at the abysmal antiquity of the scene and its soul. An ancientness so vast that measurement is feeble seemed to leer down from the primal stones and rock-hewn temples of the nameless city, while the very latest of the astounding maps in the frescoes showed oceans and continents that man has forgotten, with only here and there some vaguely familiar outlines. Of what could have happened in the geological ages since the paintings ceased and the death-hating race resentfully succumbed to decay, no man might say. Life had once teemed in these caverns and in the luminous realm beyond; now I was alone with vivid relics, and I trembled to think of the countless ages through which these relics had kept a silent deserted vigil. 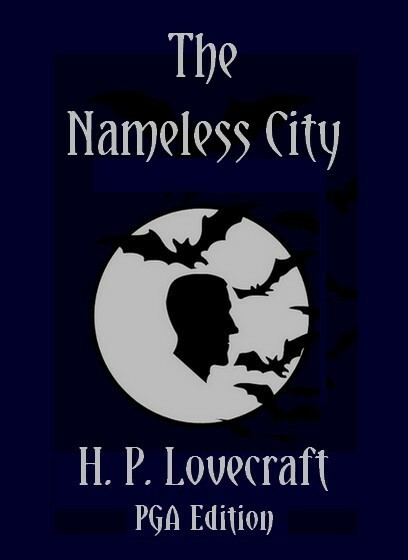 Suddenly there came another burst of that acute fear which had intermittently seized me ever since I first saw the terrible valley and the nameless city under a cold moon, and despite my exhaustion I found myself starting frantically to a sitting posture and gazing back along the black corridor toward the tunnels that rose to the outer world. My sensations were like those which had made me shun the nameless city at night, and were as inexplicable as they were poignant. In another moment, however, I received a still greater shock in the form of a definite sound—the first which had broken the utter silence of these tomb-like depths. It was a deep, low moaning, as of a distant throng of condemned spirits, and came from the direction in which I was staring. Its volume rapidly grew, till it soon reverberated frightfully through the low passage, and at the same time I became conscious of an increasing draught of cold air, likewise flowing from the tunnels and the city above. The touch of this air seemed to restore my balance, for I instantly recalled the sudden gusts which had risen around the mouth of the abyss each sunset and sunrise, one of which had indeed revealed the hidden tunnels to me. I looked at my watch and saw that sunrise was near, so braced myself to resist the gale that was sweeping down to its cavern home as it had swept forth at evening. My fear again waned low, since a natural phenomenon tends to dispel broodings over the unknown. Only the grim brooding desert gods know what really took place— what indescribable struggles and scrambles in the dark I endured or what Abaddon guided me back to life, where I must always remember and shiver in the night wind till oblivion—or worse—claims me. Monstrous, unnatural, colossal, was the thing—too far beyond all the ideas of man to be believed except in the silent damnable small hours of the morning when one cannot sleep. I have said that the fury of the rushing blast was infernal— cacodemoniacal—and that its voices were hideous with the pent-up viciousness of desolate eternities. Presently these voices, while still chaotic before me, seemed to my beating brain to take articulate form behind me; and down there in the grave of unnumbered aeon-dead antiquities, leagues below the dawn-lit world of men, I heard the ghastly cursing and snarling of strange-tongued fiends. Turning, I saw outlined against the luminous aether of the abyss what could not be seen against the dusk of the corridor—a nightmare horde of rushing devils; hate distorted, grotesquely panoplied, half transparent devils of a race no man might mistake—the crawling reptiles of the nameless city.